"Gilbert & Gaillard" has rated the wine "Piaggia - Vannucci 'Piaggia', Carmignano Riserva DOCG, Italy" from the vintage 2009 on 10.06.2012 with 91 of 100 points.
" Bright ruby-red. Intense, concentrated nose of jammy black fruits with a vanilla and vegetal element in the background and a mineral sensation. Full, fleshy palate showing savoury fruit. Notes of prune and ash on the finish. Wonderful personality. " "Wine Spectator" has rated the wine "Piaggia - Vannucci 'Piaggia', Carmignano Riserva DOCG, Italy" from the vintage 2012 on 31.03.2016 with 90 of 100 points. "Wine Spectator" has rated the wine "Piaggia - Vannucci 'Piaggia', Carmignano Riserva DOCG, Italy" from the vintage 2011 on 30.09.2015 with 90 of 100 points. "Luca Gardini" has rated the wine "Piaggia - Vannucci 'Piaggia', Carmignano Riserva DOCG, Italy" from the vintage 2012 on 01.07.2015 with 90 of 100 points. "Vinous Antonio Galloni" has rated the wine "Piaggia - Vannucci 'Piaggia', Carmignano Riserva DOCG, Italy" from the vintage 2011 on 01.10.2014 with 94 of 100 points. "Wine Spectator" has rated the wine "Piaggia - Vannucci 'Piaggia', Carmignano Riserva DOCG, Italy" from the vintage 2010 on 30.09.2014 with 88 of 100 points. "Luca Gardini" has rated the wine "Piaggia - Vannucci 'Piaggia', Carmignano Riserva DOCG, Italy" from the vintage 2011 on 01.07.2014 with 83 of 100 points. "Falstaff Magazin" has rated the wine "Piaggia - Vannucci 'Piaggia', Carmignano Riserva DOCG, Italy" from the vintage 2010 on 14.02.2014 with 92 of 100 points. "Vinous Antonio Galloni" has rated the wine "Piaggia - Vannucci 'Piaggia', Carmignano Riserva DOCG, Italy" from the vintage 2008 on 01.06.2012 with 93 of 100 points. "Vinous Antonio Galloni" has rated the wine "Piaggia - Vannucci 'Piaggia', Carmignano Riserva DOCG, Italy" from the vintage 2009 on 01.06.2012 with 92 of 100 points. "Vinous Antonio Galloni" has rated the wine "Piaggia - Vannucci 'Piaggia', Carmignano Riserva DOCG, Italy" from the vintage 2006 on 01.07.2010 with 92 of 100 points. "Wine Spectator" has rated the wine "Piaggia - Vannucci 'Piaggia', Carmignano Riserva DOCG, Italy" from the vintage 2006 on 31.10.2009 with 91 of 100 points. "Wine Spectator" has rated the wine "Piaggia - Vannucci 'Piaggia', Carmignano Riserva DOCG, Italy" from the vintage 2005 on 31.10.2008 with 91 of 100 points. "Wine Enthusiast" has rated the wine "Piaggia - Vannucci 'Piaggia', Carmignano Riserva DOCG, Italy" from the vintage 2003 on 03.01.2008 with 92 of 100 points. "Wine Spectator" has rated the wine "Piaggia - Vannucci 'Piaggia', Carmignano Riserva DOCG, Italy" from the vintage 2004 on 15.10.2007 with 91 of 100 points. "Wine Spectator" has rated the wine "Piaggia - Vannucci 'Piaggia', Carmignano Riserva DOCG, Italy" from the vintage 2003 on 15.10.2007 with 90 of 100 points. 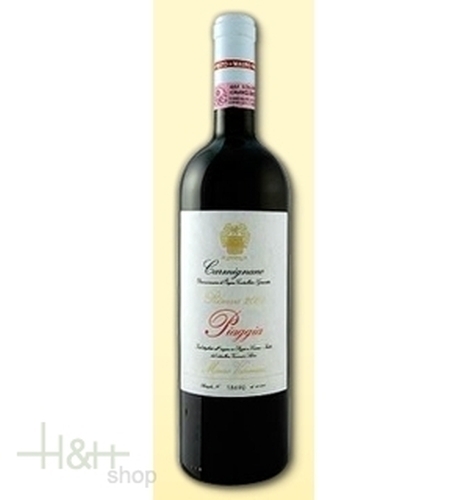 "Robert Parker The Wine Advocate" has rated the wine "Piaggia - Vannucci 'Piaggia', Carmignano Riserva DOCG, Italy" from the vintage 2001 on 24.04.2006 with 95 of 100 points. "Wine Spectator" has rated the wine "Piaggia - Vannucci 'Piaggia', Carmignano Riserva DOCG, Italy" from the vintage 2000 on 31.10.2003 with 90 of 100 points. "Stephen Tanzer" has rated the wine "Piaggia - Vannucci 'Piaggia', Carmignano Riserva DOCG, Italy" from the vintage 1998 with 93 of 100 points. "CellarTracker" has rated the wine "Piaggia - Vannucci 'Piaggia', Carmignano Riserva DOCG, Italy" from the vintage 2003 with 92 of 100 points. "CellarTracker" has rated the wine "Piaggia - Vannucci 'Piaggia', Carmignano Riserva DOCG, Italy" from the vintage 2008 with 92 of 100 points. "CellarTracker" has rated the wine "Piaggia - Vannucci 'Piaggia', Carmignano Riserva DOCG, Italy" from the vintage 2006 with 92 of 100 points. "CellarTracker" has rated the wine "Piaggia - Vannucci 'Piaggia', Carmignano Riserva DOCG, Italy" from the vintage 1999 with 92 of 100 points.